Reddit, Sunil Tripathi, and "retweets aren't endorsements": Who's to blame? A Facebook page dedicated to finding missing Brown student Sunil Tripathi. He was mistakenly identified on Reddit and Twitter as a suspect in the Boston bombings. It’s a question that a lot of people, including me, grappled with at the time. But it’s worth revisiting with the benefit of some distance and some solid reporting by author Jay Caspian Kang. The rush to online judgment was, after all, what led to missing Brown University student Sunil Tripathi being widely misidentified as a suspect in the first place. One thing we’ve been struck by is how porous the space is between social media, the media and law enforcement. We assumed that if random people on Twitter were sitting in their pajamas saying, ‘Here’s this kid missing in Providence that’s skinny, and here’s something horrible that happened because of a kid who’s skinny,’ that speculation would be contained within a certain space. “Porousness” seems like exactly the right diagnosis. Five years ago, it would have taken far longer for such unfounded rumors to reach the public at large—enough time that they probably could have been debunked before they did real damage. Today, they’re broadcast on Reddit one moment, amplified on Twitter the next, and have essentially become national news before a single professional reporter has picked up a phone. Some new-media evangelists will shrug: This is the world we now inhabit, and the benefits outweigh the collateral damage. And yet Sangeeta’s expectation—that damning allegations against private individuals remain “contained within a certain space” until someone has checked them out—seems like one that should be justified, even in the instant-information age. The Times piece doesn’t mention that one of the paper’s own reporters, Bill Carter, was also among the journalists who retweeted the rumors—as were several of Kang’s Grantland colleagues. So was Slate’s own Farhad Manjoo, who wrote a thoughtful reflection on the snafu the following day. I didn’t bite on the Tripathi rumors that night, but I’m sure I’ve repeated false information at some point in my own Twitter career as well. So if you’re going to blame Reddit, you’d better be ready to blame all these other folks too—and many more. When I tweet that CNN is reporting that authorities have someone in custody and then 10 minutes later tweet that NBC is tweeting that nobody was in custody, I’m not saying one is right and the other is wrong. Instead, I’m using Twitter as a tool to get out what information is out there and tracing it back to the source. And that’s the crux of the problem. Redditors see Reddit as a contained space for speculation and maintain that it isn’t their responsibility to verify information before posting or upvoting it. Tweeters see Twitter as a contained space for speculation and maintain that it isn’t their responsibility to verify information before posting or upvoting it. Professional journalists, by and large, recognize that it is their responsibility to verify information before publishing or broadcasting it—but many still view their tweets as immune to such standards. Kang concludes that “to blame Reddit is to pretend that the platform is the problem.” But the truth is that the platform does matter. From Twitter’s 140 characters to Reddit’s upvote system to cable news’ relentless pressure to fill airtime, the medium shapes the message. In Twitter’s case, the ease and ambiguity of the “retweet” button goes a long way toward reducing the sense of personal responsibility for broadcasting information that may turn out to be false. There is some logic to Byers’ “retweets aren’t endorsements” defense, cliché that it is. Journalists on Twitter should be free to highlight tweets that they find amusing, fascinating, or controversial without having to stand by all the sentiments therein. And the pure retweet at least has the virtue of clear attribution, as opposed to a tweet like Kaczynski’s that reads as a declaration of fact. But uncritically retweeting explosive, unverified allegations about private individuals is a different matter. Suppose Byers were right that all the responsibility lies with the original posters of false information, and none with the retweeters and upvoters. Where would that leave us? It would leave us blaming a few obscure bad apples, like @ghughesca, while indemnifying the mechanisms that spread the rot throughout the barrel. Retweets may not be endorsements, per se. 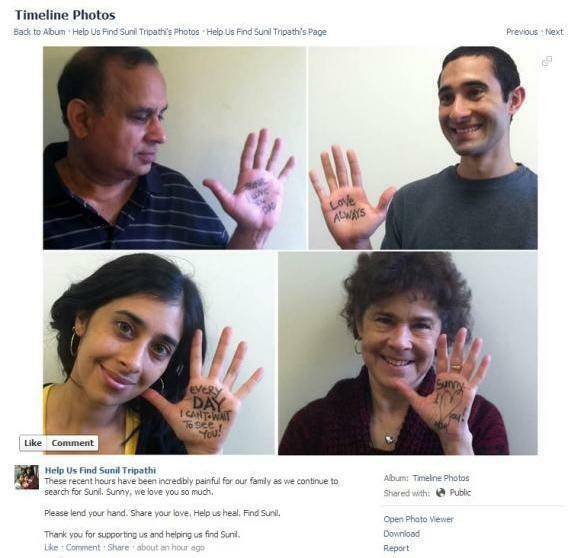 But try telling that to Sunil Tripathi’s family.